If you've had a workout being thrown about in crashing beach waves, then this hearty Hawaiian meal will fill any appetite! My Loco Moco Plate recipe video is just a click away futher below. Loco Moco, while not made with native Hawaiian ingredients, is still an island original. It was developed here and it's served everywhere. 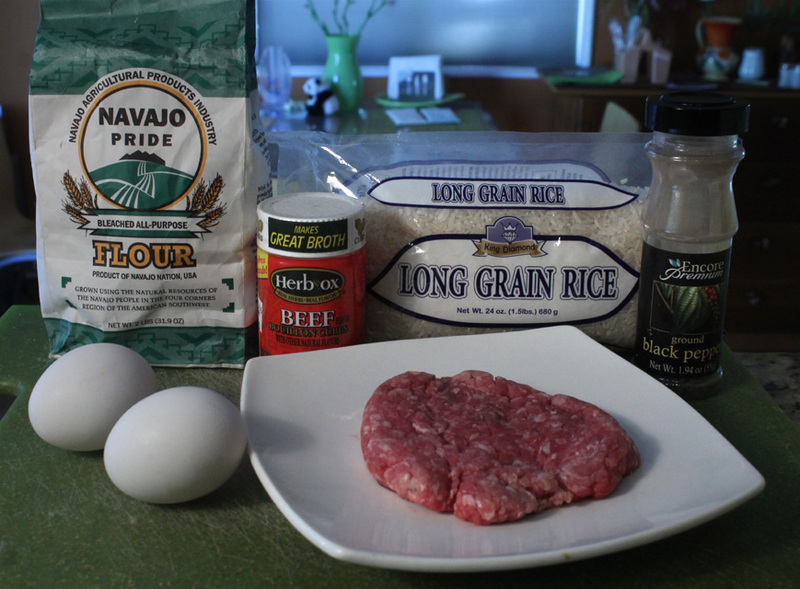 The basic ingredients are white rice, hamburger, gravy, topped with fried eggs. Although it may seem a breakfast meal, locals get it anytime of day. You may not want to eat Loco Moco Plate every week, but it's worth a try, at least once. When in Hawai'i, sometimes you gotta go local. This meal is not for the faint of palate. Boy, is it good going down. Just break the egg yolk and mix it with a slice of beef patty and gravy - try to make room on your fork for a little rice, too. While just a meat beef patty, a hunk of beef is a good substitution for typical Mainland ham or bacon. It's simply seasoned with salt and pepper. The white rice is just plain, and that's fine -- it there to soak up the rich beefy gravy. The gravy brings it all together. The gravy is nothing unusual. I made mine with the pan dripping after frying the beef patty. Just add a little water and flour (to thicken the gravy.) 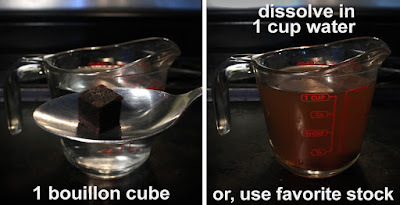 You can boost the flavor with chicken or beef stock - I added one beef bouillon cube. When I stayed in Waikiki a couple months ago, I got my first Loco Moco Plate Lunch at the Rainbow Drive-In. The Rainbow Drive-In is world renowned for it's cheap and tasty local cuisine, my kind of place. My huge serving is just under $8 bucks, and filled me up for the rest of the day. Just click here to see my video that features the Rainbow Drive-In. 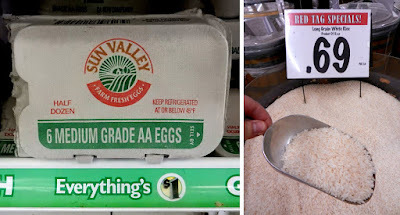 Eggs aren't as cheap as they used to be. 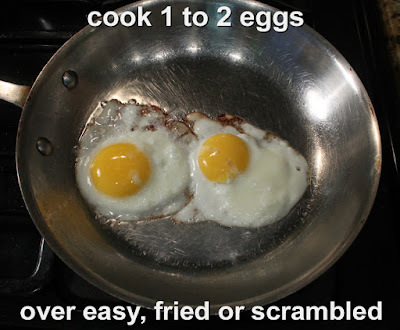 I'm luck to get a dozen for two to four bucks, but for this recipe you only need one or two eggs. I can still get them at the Dollar Tree for half a dozen for a buck - not too bad. 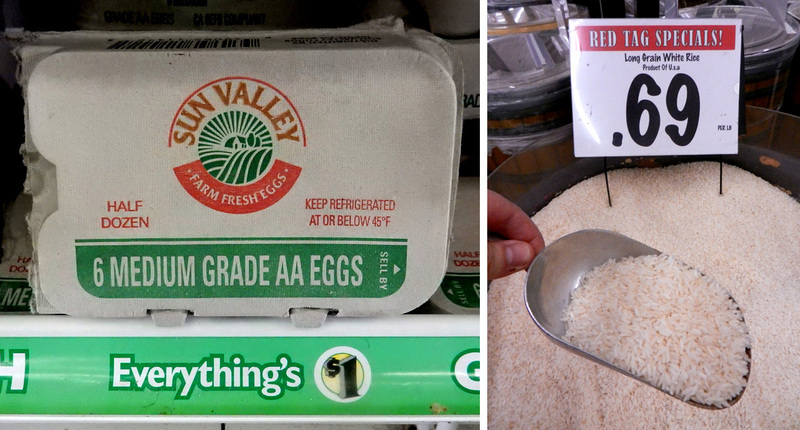 Of course rice is still cheap - I get mine from a local Mexican grocery for 69 cents per pound. For the gravy part you only need a tablespoon of flour, one beef bouillon cube (or a favorite stock) and a cup of water. So if you want a cheap$kate taste of the Islands of Hawai'i, try my deliciously filling Loco Moco Plate. You won't need seconds -- if you can finish it! Play it here, video runs 3 minutes, 50 seconds. 1 hamburger patty - about 1/3 pound of ground beef. Okay to use lighter ground turkey or chicken. 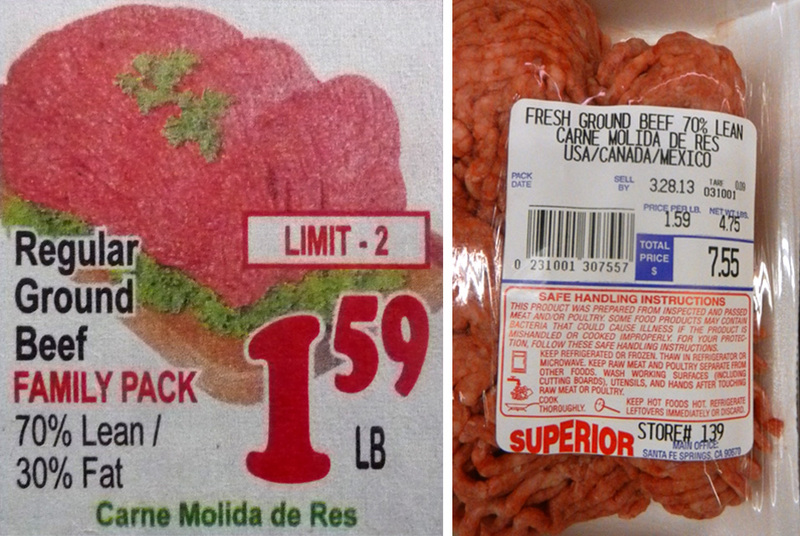 Make hamburger patty as large as you can afford. 1 to 2 eggs - I like sunny side up or over easy. Okay to scramble, too. Cook the eggs any way you like. 1 cup Cooked white rice - follow package directions. Okay to use brown rice. I have a Sticky Rice recipe below, too. Black pepper to taste - I find that the gravy with a bouillon cube is salty enough for me. You can salt the eggs, though. Meat drippings from frying - okay to pour out some grease. 1 tablespoon flour or corn starch - to thicken gravy. 1 bouillon cube of beef or chicken - optional, for extra flavor. 1 teaspoon Worchestershire sauce - optional for more extra flavor. Make a basic rice recipe according to package directions. Add water about 1 1/2 cup of water to 1 cup of rice. Bring to a boil and reduce heat to low, then cover pot. Cook about 20 minutes then turn off heat. Let rice rest for about 5 minutes, to make sure it cooks all the way through. For Japanese-style Sticky Rice first rinse the rice a few times. Add one cup of water to one cup of rice. Bring to a boil then reduce heat. Cover and cook 15 minutes. Turn off heat and allow rice to rest another 10-15 minutes. If you have a rice cooker, then use it. Keep rice at room temperature until ready to use. Once rice is done, you can start making Loco Moco. Add hamburger to a medium/hot frying pan. Saute until brown on both sides, to your desired doneness. Depending how thick the hamburger patty, it will take about 5-10 minutes total. Make a small slice into thickest part of patty to check. Set cooked hamburger patty aside. For gravy, use the same pan you cooked the hamburger - don't clean it out, that's where all the gravy flavor lies. 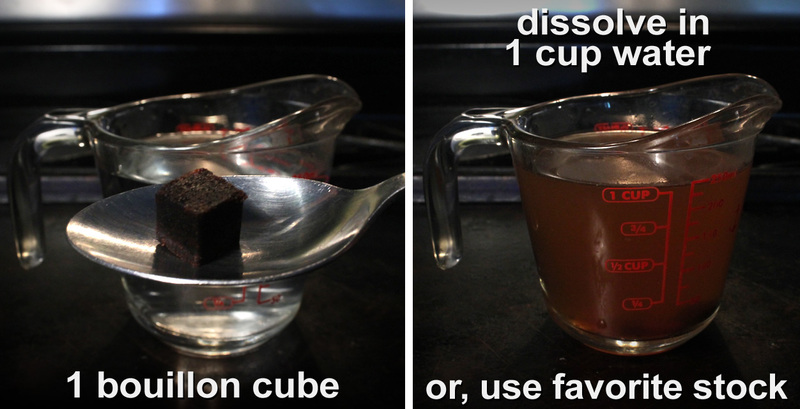 Drop in a bouillon cube into a cup of water. 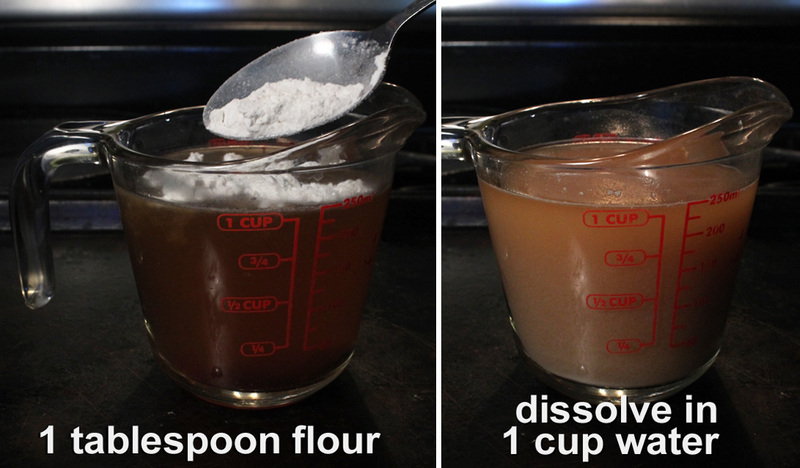 Break it up to dissolve. Add a tablespoon of flour or corn starch to bouillon/water. Okay to use any favorite broth like beef ,chicken, or vegetarian. Pour in the water/flour mixture into medium/hot pan. Scrape the bottom of pan to loosen tasty bits, and dissolve the bouillon cube. Bring gravy to a low simmer. Gravy will thicken in 3-5 minutes. 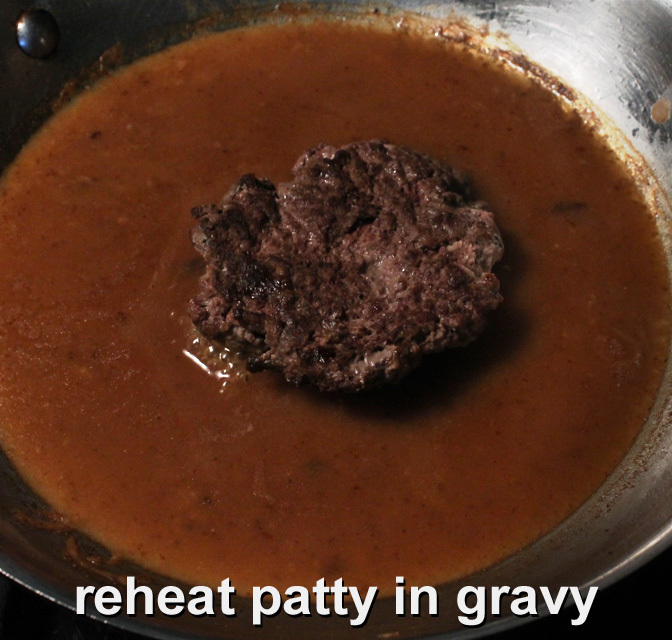 When ready add cooked beef patty to keep it warm in gravy. Turn heat to low. Finally cook the eggs in a pan. 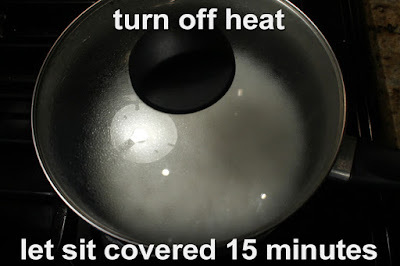 Add non-stick spray or oil to a medium heated pan. Cook egg the way you like it. I make mine sunny side up or over easy. Cook until whites of egg are firm, but yolk still soft and runny. If you like a scrambled egg then do it your favorite way - it's all good. If you have Hawaiian-style Macaroni Salad (click here for my recipe,) you can add a scoop, too. This recipe is easy to double. Just cook an extra beef patty and eggs. The rice and gravy should be enough for two servings. If you want more gravy add another half cup of water and a teaspoon of flour. After frying the beef patty, it's okay to pour out some of the grease, but do leave a tablespoon for flavoring the gravy. You could add a teaspoon of Worchestershire sauce to gravy for extra flavor. For this recipe I leave out salt, as a bouillon cube or stock has plenty for me. You can add some to eggs and meat when frying, if you like. A great Hawaiian radio and internet station that I feasted on, selecting a few tropical tunes for my travelogue videos, called "Territorial Airwaves - Your Source for the History of Hawaiian Music."